from the Spring/Summer issue of Reflections magazine. Lyda Neal says she had been praying about direction for her little church of St. Matthew’s in Edinburg. 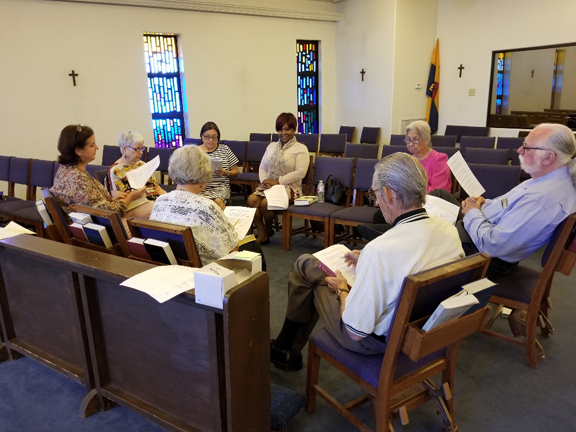 She had heard about The Story when she was on a Cursillo team several months earlier, but when it got highlighted at Diocesan Council this past February, she decided to act on it. Neal had been a teacher, now retired, for many years, and she knew that it always works better when the school’s principal takes the lead and gives some guidance to the teachers under him or her. “So when the bishops said at Council they would like us to read the Bible, it gave us the push we needed,” she says. St. Matthew’s is not currently headed by a permanent priest. During the winter months, November to May, the Rev. Art Hadley has served the congregation. Now they rely on the occasional supply priest, of which there are few in the Valley, and read Morning Prayer on most Sundays. So taking on The Story has been a lay-led effort. St. Matthew’s started by ordering copies of The Story and handing them out to everyone in the congregation; the church paid the cost of $5 a book. And while not everyone in the church comes to the weekly Bible study, “even for those who don’t, they have the book and you never know when they might pick it up,” says Neal. For additional resources, St. Matthew’s turned to www.thestory.com and the diocesan Basecamp site where there are daily and weekly reading schedules, sample Sunday bulletins, even a schedule of music choices to go with each week. Every week, Lyda Neal draws from these resources and the discussion questions from The Story Participant’s Guide, adds some questions of her own, and prepares a handout for participants. Most rewarding for Neal is when participants tell about something new they have learned – some “Aha” moment they had while reading The Story or during the discussion. “I never knew that,” or “I never thought of it that way,” they say. For more information on The Story and other Bible study see these resources.